Designer pieces are like works of art to me. They're intricately designed with beautiful details & high-quality materials. They're unique, hard to find, & lusted after by both collectors & common folk alike. Oh & they're expensive, of course. 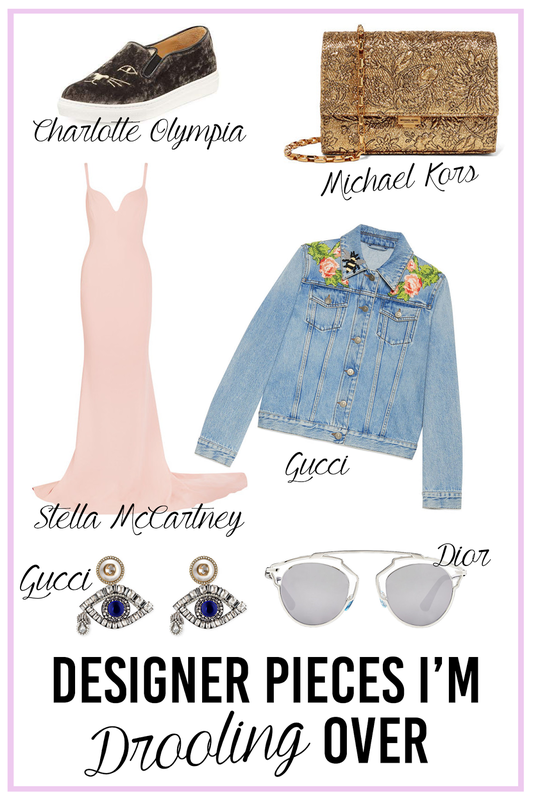 Take a look-see at some of the designer pieces I'm drooling over! Hopefully you like something too. The Michael Kors Collection Yasmeen bag is so pretty with its gold brocade details & detachable gold strap. I could wear it anywhere! Denim is always fabulous, but the Gucci embroidered denim jacket with needlepoint florals & a bee on the collar just makes my heart sing. I adore little details like that. If I were a princess, the Stella McCartney Stretch-Creme Dress Blush (or even the red evening gown) would be mine. I melt over beautiful blush dress with its elegant floor-sweeping train & sweetheart neckline. Charlotte Olympia is known for her chic kitty flats, but these Cool Cats Velvet Slip On Sneakers make for the perfect complement to the season. I'm all about velvet. But hey, I'll just have to drool over these a bit longer. Hi Carmen, I love that blush dress as well. There may be a pink blush skirt on my blog today that you may like! haha! Those Gucci earrings are gorgeosu!! wow this micheal kors bag is so beautiful and unique ! love it ! OMG i am loving the blush pink moment and that dress is AMAZ-BALLS! The Dior sunglasses are sooo beautiful! I would just be way too afraid of breaking them, haha! The Michael Kors bag is so beautiful, no wonder it's sold out! These are all great pieces and that Michael Kors purse is just wow! The MK bag is just AMAZING! That's my favorite bag brand. Thanks for sharing so many amazing things. Me too. Such a pretty color! Love it as well. So pretty!